A Mini Mario on a platform, collecting coins and avoiding Bullet Bills. Elevation Station is one of the minigames in Mario and Donkey Kong: Minis on the Move. For this minigame the player needs 10 stars to unlock the first level, 40 stars to unlock the second level and 80 stars to unlock the final level. The player uses the to rise and lower the Mini Mario on the bottom screen to collect coins, while avoiding enemies. Hitting a enemy will make the Mini Mario explode, ending the game early. Taking the stylus off the bottom screen will result in the platform falling quickly. Normal coins are worth 100 points. Star coins are worth 500 points. The player must score as many points as possible before the Mini Mario reaches the green pipe. In the top right corner of the screen is the timer. The timer shows a Mini Mario getting closer and closer to a Star, showing the player how far they are from the pipe. Elevate your Mini Mario to collect all the coins! 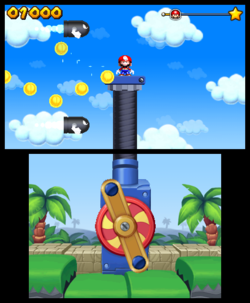 Elevation Station features a Mini Mario on a platform that the player can move up and down. Maneuver the Mini Mario to collect coins while also avoiding the numerous enemies and obstacles. Collect as many coins as you can before reaching the pipe! This page was last edited on December 18, 2017, at 12:08.